Spread onto a serving plate. In a small bowl, combine all ingredients and gently toss. Scoop into a serving bowl and garnish with fresh basil leaves. Chill the goat cheese in the freezer for 10 minutes to firm up. Using a sharp knife (or a piece of plain dental floss), slice the log of goat cheese into 12 (1/2 inch) pieces. If using a knife, clean it off with hot water after each cut to keep the goat cheese rounds intact. Carefully arrange the rounds on a parchment paper lined baking sheet and chill in the freezer for another 10 minutes. Meanwhile, using your hands, crumble the crackers into small pieces over the bowl of a food processor fitted with a steel blade. Blend crackers until fine crumbs form, about 20 seconds (the crumbs don’t have to be perfectly uniform, some larger chunks are fine and will add great texture). Add salt, pepper and dried basil, pulse to mix, and transfer crumbs to a wide bowl. When the goat cheese rounds are cold and very firm, work one at a time to dip in the flour, then the beaten eggs, then the cracker crumbs. Make sure the cheese is completely coated then repeat with remaining rounds. Return the baking sheet to the freezer for at least 10 more minutes. Meanwhile, fill a large, heavy-bottomed pot with about 1 inch of coconut oil (warmed in the microwave, if needed, to liquefy). Attach a thermometer to the pot and heat oil over medium-high heat to 375°F. Fry the slices, a few at a time, for about a minute or until the crumbs turn golden brown. Flip the rounds and fry another minute, until golden all over. Drain the rounds on a paper towel-lined plate and sprinkle with salt. Wait for the oil to return to 375°F and continue the process until all goat cheese rounds have been fried. Serve immediately with Wellington crackers and tomato olive salsa. In a small bowl, combine tomatoes, olives, lemon juice, lemon zest, olive oil and salt and pepper. Taste and adjust salt or lemon juice if needed. Just before serving, stir in basil. 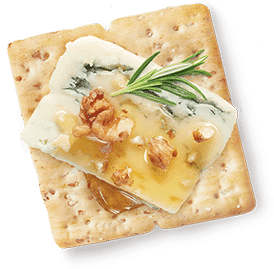 Serve spooned over fried goat cheese medallions and Wellington crackers. Average 3-4 pound corned beef brisket will need cooked in a crockpot on high for 4-5 hours, or 7-8 hours on low temp. Alternately the brisket can be cooked sous-vide at a temperature of 145 for 48 hours, and later broiled to crisp the outside. Lay the crackers out on a sheet or oven safe pan. Top with cheese, corned beef and sauerkraut. Place in the oven at 350 degrees for 5 minutes, or until the cheese is melted. Remove from the oven, and drizzle thousand island dressing over the nachos. Garnish with peperoncini and serve warm.